A premises liability case results when a plaintiff who sustains an injury on another person’s property because of a dangerous condition on that property sues the owner or operator of that property. The owner or operator of a property has a duty of care to you to keep the property in a safe condition. If that property’s unsafe condition leads to your injury, then you could have a premises liability case. Premises liability cases run the gamut from injuries from slip and falls, improperly functioning or maintained equipment, to injuries at essentially any location or structure such as construction sites, amusement parks, in homes, and at businesses. If you are injured because a dangerous condition on another’s property, it is important that you consult with an experienced Riverside personal injury lawyer who can give you a realistic assessment of your claim and advise you how to proceed. 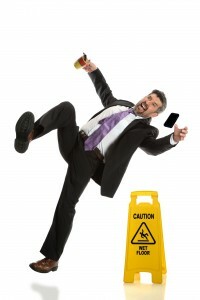 There are essentially two types of premises liability categories — commercial and residential. The difference is important because it affects the duty of care that the defendant owes you and the extent to which the defendant is liable for your injuries. The specific facts of your case determine the merits of your case and the extent of a defendant’s liability to you. Business owners tend to have a higher standard of care to their patrons and customers. This duty of care includes regularly maintaining the premises for its intended use, having the building and its business up to code, having the premises regularly inspected, secure, and any other reasonable steps to ensure the safety of persons on the premises. As an example, if the stairs leading to a business are slippery on a rainy or snowy day, it would be prudent for a business owner to have a sign that the stairs are slippery or have them cleared more regularly. A homeowner’s duty of care to a person on their premises depends on the reason that the person is on the property. For example, a trespasser is generally owed very little duty of care (as they should not be on the property). A licensee who is on the property for social reasons or to perform a repair and the like, would be owed a duty of care by a residential property owner or lessee. An invitee would be afforded the highest level of protection by a defendant. There are numerous ways that a person on a residential property can be injured such as improper lighting, a faulty staircase, an electrical problem or an unusual or unsafe condition. Whether a defendant will be held liable depends on the type of injury, and whether the defendant warned the persons on the property of any unsafe conditions and gave the persons on the property safe alternatives to avoid injury. The person causing the injury (defendant) owned, operated or leased the property upon which you sustained your injuries. It is usually clear whether the owner, operator or lessee is responsible for a property and maintained the property in reasonably good condition for its intended use. The defendant was negligent in the use of the property. The defendant owes a duty of care to you to ensure that the property is reasonably safe based on a reasonable person standard. The defendant is required to warn you of known and latent dangers on a property, including those that the defendant either knew or should have known could cause injury if the defendant exercised reasonable care. For example, if a defendant owns and operates a business building, the defendant would be required to make sure that the premises’ structure is safe, up to code, functioning properly, and regularly maintained. Potentially unsafe conditions such as wet floors or areas being repaired or remodeled should be clearly marked. You were harmed. You would have to sustain actual injuries because of the unsafe condition on the premises to have a case against the defendant. This is usually established through the use of medical records and expert testimony. The defendant’s negligence was a substantial factor in causing you harm. You must show that the defendant’s negligence was a reasonably foreseeable cause and a substantial factor of your injuries. If you think that you have a premises liability case, here are steps to take to ensure that you have the evidence that you need and that your case is handled properly. Speak with your attorney for guidance about how to proceed and what you can do to help with your case. Report the incident to the owner or manager of the establishment where you were injured. Be sure that a written report is prepared and that you obtain a copy of that report. Write down the name, date, time, telephone number and email address of the person who handles your incident report. Take photos of the scene of the accident, including the surrounding areas. Make a copy of those photos as a backup and keep the originals to preserve the chain of custody. List any witnesses. Get their names, telephone numbers and email addresses so that you have their contact information. Keep any articles of clothing or other items that were damaged. Speak with your attorney about how to handle that evidence. If you need medical attention, obtain it promptly and have your medical care providers document the reason for your injuries. Be as detailed as you can with your medical care providers. Do not sign any documents regarding liability or fault for any accident, including a waiver, without speaking with a knowledgeable Riverside personal injury lawyer.